The Ratiu Foundation houses in its Manchester Square building two archives which are very important for a clear understanding of the Romanian exile, and a chronicle of the unsung campaign for freedom and democracy in Romania which took place in the West a long time before the Romanian revolution of 1989. These are the Ion Ratiu and Viorel Tilea archives. Both the Ratiu and Tilea archives are hosted in The Ratiu Foundation Building, in London. 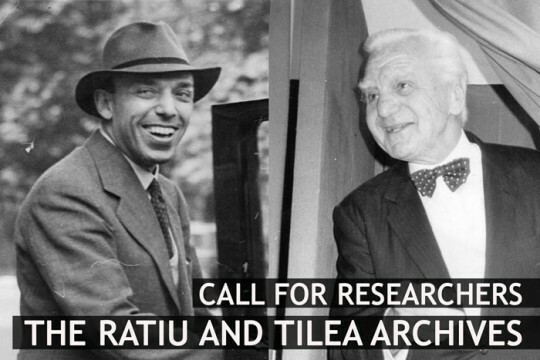 The Ratiu Foundation plans to open the Ratiu and Tilea archives for research during the summer of 2011, within a residency programme lasting for a maximum one month. The researchers (MA or PhD students, academics, affiliated or non-affiliated to an institution of higher education) are invited to send their proposals for study to mail@ratiufamilyfoundation.com, for the attention of Ramona Mitrica, Director. The deadline for receiving proposals is 1 May 2011. The Ion Ratiu Archive contains various documents, personal, political and business papers and letters which belonged to Ion Ratiu. A well organised man, Ion Ratiu filed a great number of his papers starting from 1940, continuing on up to his death in 2000. The London archive contains over 2,000 folders, among which can be found correspondence with important Western politicians and journalists, with members and leaders of the Romanian diaspora from the UK, Western Europe, USA and Australia, and a great number of documents and letters about the work of the World Union of Free Romanians (whose elected president was Ion Ratiu). The Ion Ratiu Archive has been catalogued, but it is still to be fully investigated � although researchers from The Holocaust Museum in Washington, and historians such as Stejarel Olaru and Marius Oprea have looked through it on various occasions. Viorel Virgil Tilea CBE (1896-1972) was a Romanian diplomat, most noted for his ambassadorship in the United Kingdom during the Second World War. He was Ion Ratiu�s uncle and while in London, he invited his nephew to join Romania�s Foreign Service. This enabled the young Ion Ratiu to come to London as a legation chancellor, in April 1940. Viorel Tilea kept precise records of his work and correspondence, and the papers which are in the possession of the Ratiu Foundation in London start, approximately, in 1918, although there are also earlier documents connected to his research on Dr Ioan Ratiu, and Iuliu Maniu. The Tilea Archive contains both personal and official correspondence and documents, some of them from Tilea�s time in the cabinet of Prime Minister Alexandru Vaida-Voevod, until his appointment as ambassador to London in 1938. Part of the documents and correspondence is centred on Viorel Tilea�s efforts to create a Free Romanian Movement during WW2. The Viorel Tilea Archive is in the process of being fully catalogued. The image above shows Minister Plenipotentiary Viorel Tilea leaving the London Foreign Office in 1939 (on the left), and Ion Ratiu voting in the first elections in post-revolutionary Romania, May 1990 (on the right). Photos � The Ratiu Foundation.